In the morning I walked to the petrol station where Lena had told me I would probably able to service the motorbike myself to find out whether it was possible and how it worked, I was carrying all the tools and spares I needed except for the oil, since I was originally planning to service the bike myself in the middle of nowhere, and now, despite the fact that it would be easy and convenient to find a workshop, I wanted to do it myself so as to save some much-needed money, but the main problem was to dispose of the used oil properly, I did not want to dump it in the middle of the Swedish countryside. When I got to the petrol station I saw a building with six garage doors behind it, a couple of them open, one with a man pressure washing his car and another with a car on a hydraulic lift and two men working under it, so I thought that must be it. I went into the petrol station to ask and they told me that the garages were rented by the minute, and they had oil disposal facilities, as well as pressure water and air. This was, after all, the country who had given the world Ikea, and DIY is a big thing here. You can rent tools or space to do anything you can imagine yourself. They gave me the keys to number 2, but there was a problem with oil buckets, they were designed to be placed under a car that had been put on a lift, and so there was no way to put one under the bike, and it would be useless to put the bike on a lift as the sump is in the middle longitudinally, not laterally. The young man from the petrol station went off to try and find a solution and shortly after he came back with an old bucket that he cut in half to make it fit under the bike. Nice! I spend all morning there, as not only did I have to change the oil but also the air filter, and that meant removing the petrol tank. 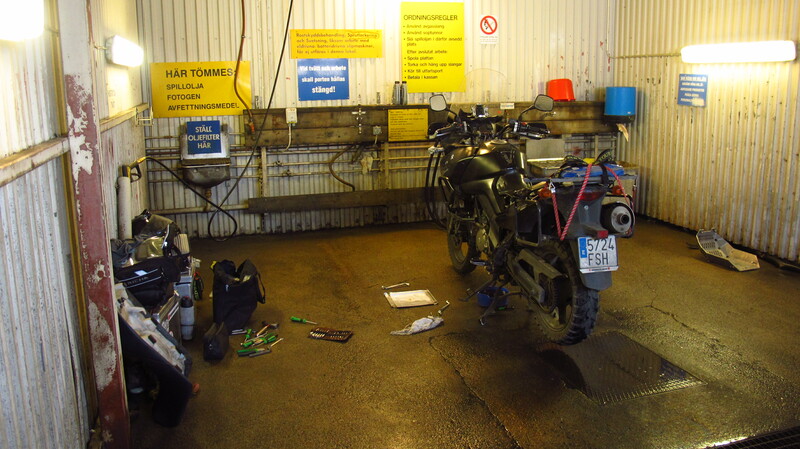 This is one of the things I do not like about the V-Strom and definitely something I will take into account when the time comes to replace it – there is too much plastic on the bike, and it takes forever to remove it when it is time to service it. When I had finished, I cleaned the bike, which I had not done since Astrakhan and the poor thing was covered in several layers of dust, mud, insects and bits of plants. In the end it cost only 88€, including the price of the oil, a set of fuses and a pair of plastic gloves I bought. Not bad. I took the bike back to Lena’s apartment and then went off to visit some of the things she had recommended in the city. 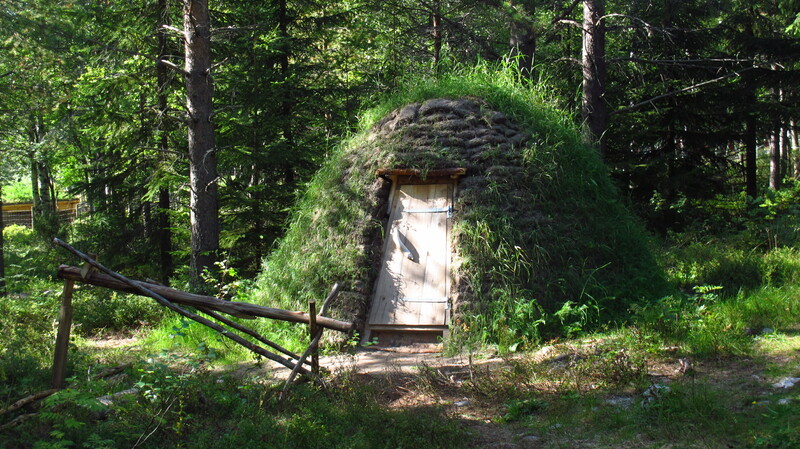 Just past the petrol station there was a small hill covered in forest, and she had told me that there was an open air museum with traditional Swedish farmhouses and also Sami camps, which had been taken from all over the country and brought here. 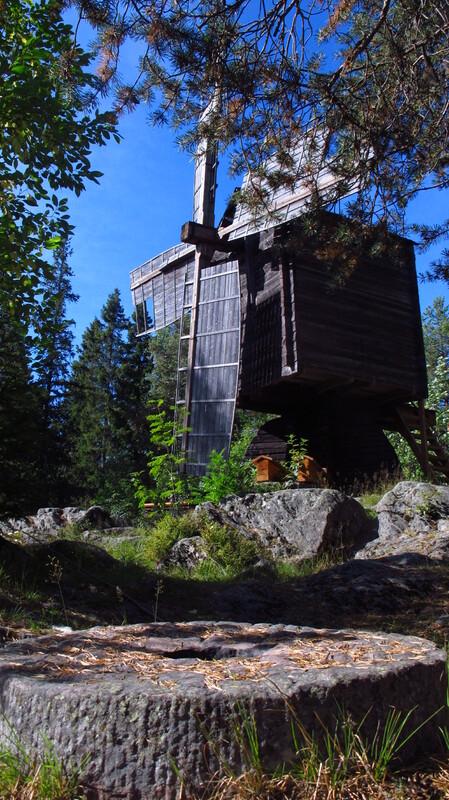 It was a very interesting visit, there were traditional farmhouses, barns, stables, storehouses, a windmill and three Sami camps, all original buildings. Explanations were given in three languages, including English, and there was also a very clever system of audio guides. 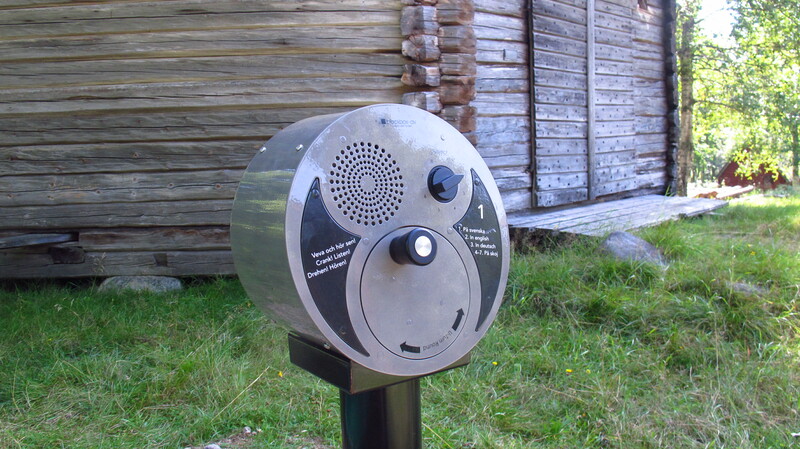 From time to time you could find a round metal device mounted on a pole with a handle that you had to crank for about 20 seconds; that generated enough electricity for the device to play an explanation. No electrical wiring needed, no batteries to be charged, no audio sets that might get stolen, no staff to distribute them. Very practical for an outdoor exhibit. After that I walked down into town and wandered around until I found the river, and by the river, the modern arts museum which Lena had also recommended. 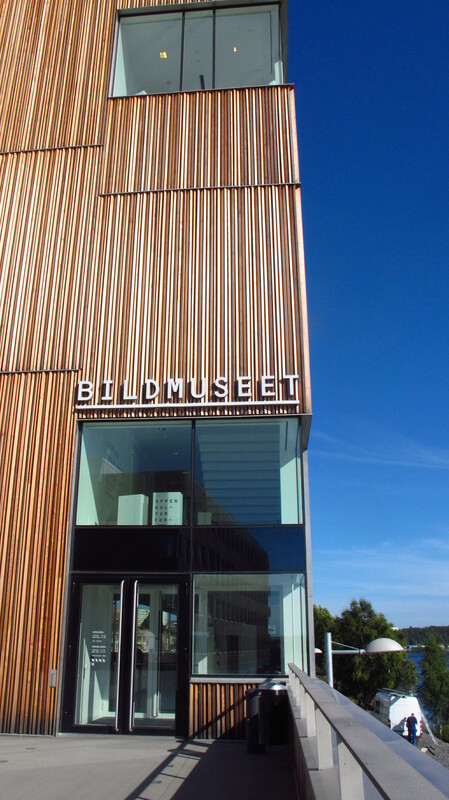 It was a new building, very Scandinavian in style – wood and glass on the outside, white walls and open spaces on the inside, very nice. There were six floors and as with the open air museum on the hill, everything was free. When I was about to finish the last floor, Lena sent me a text message inviting me to a concert that was going to take place that evening on the beach. It sounded like a great plan, so I went back to the apartment, where I met a colleague of hers from Umeå University, a woman from Colombia who had been living in Sweden for more than 20 years and was working in the Spanish department. She drove us to the beach where the concert was taking place, and we found a nice spot to lay down some blankets and sit on the sand. There was quite a lot of people of all ages, sitting on blankets or on picnic chairs, and the atmosphere was very nice. 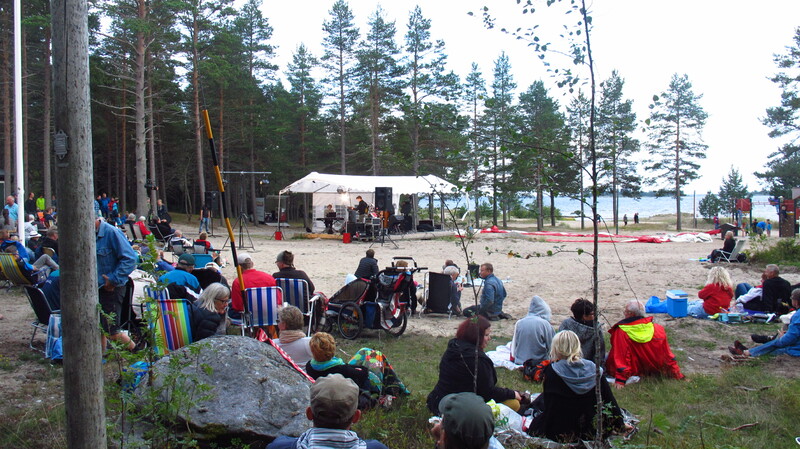 It was a sort of music festival, and we saw several bands with styles ranging from folk to jazz , including rock music and covers. We got back home at about 11 pm, and had a coffee before going to bed. The coffee turned into a long conversation about politics, clichés, the EU, teaching, and all other kinds of interesting matters, and we ended up going to bed quite late. As Lena had to work early the following day, we said goodbye before going to bed and I thanked her for her hospitality. In the end I had decided to go down the Swedish cost to Stockholm and cross into Finland from there for several reasons – it was not as expensive as I thought, and I could still travel within budget, I had been told that the landscape on the coast was very nice, and I wanted to have some days to have the chain checked at a bike workshop, as it was still making some noise despite my cleaning and greasing it regularly.